Indigenous people are fiercely guarding their lands in the Amazon against deforestation and studies say there is less deforestation where these tribes still live. They could be just the lifeline the struggling forest needs. 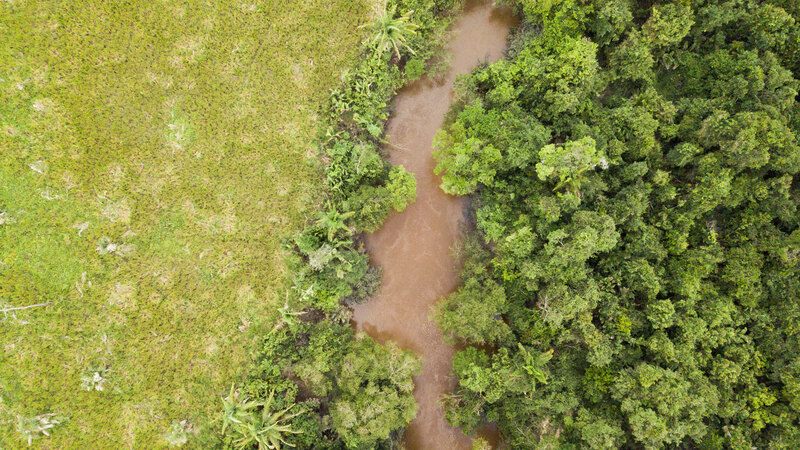 Top video: The Caru River marks the boundary between land in the Brazilian Amazon controlled by Indigenous people and that controlled by others. The indigenous land is remains pristine forests, while the land on the opposite bank has been converted to agriculture. Claudio da Silva, thickset, his bare chest traced with blue-black lines of body paint, wields a chainsaw not to cut down trees but to destroy a wooden timber hauler used by a band of illegal loggers. 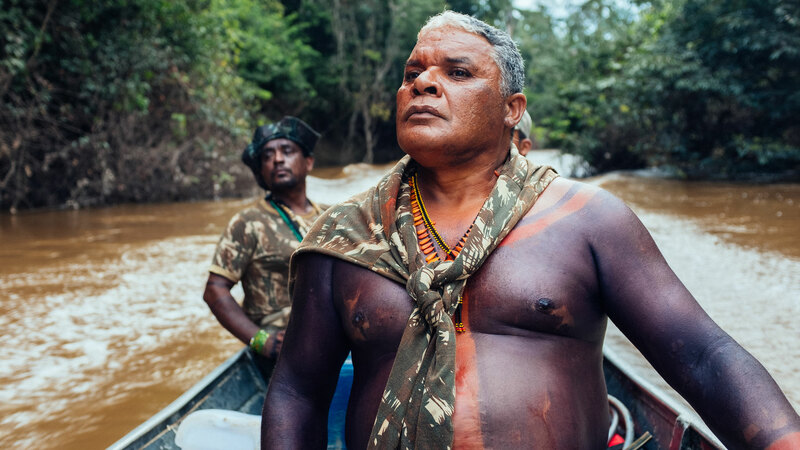 Da Silva is a member of the Amazon’s Guajajara tribe in the Brazilian state of Maranhão and the leader of an armed group of Indigenous forest protectors called the Guardians of the Forest. Illegal logging and land clearing continue to eat away at the world’s largest remaining tropical rainforest. But the guardians and others like them in Brazil are pushing back. 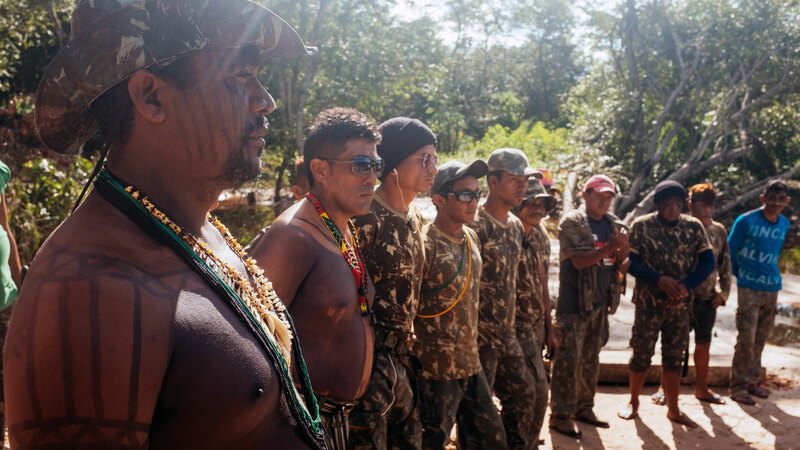 On a summer day, da Silva and the guardians prepare to patrol the Caru River, a narrow strip of muddy water marking up the boundary of the Guajajara’s 700-square-mile forest reserve. The land is protected on paper, but it’s under constant threat. 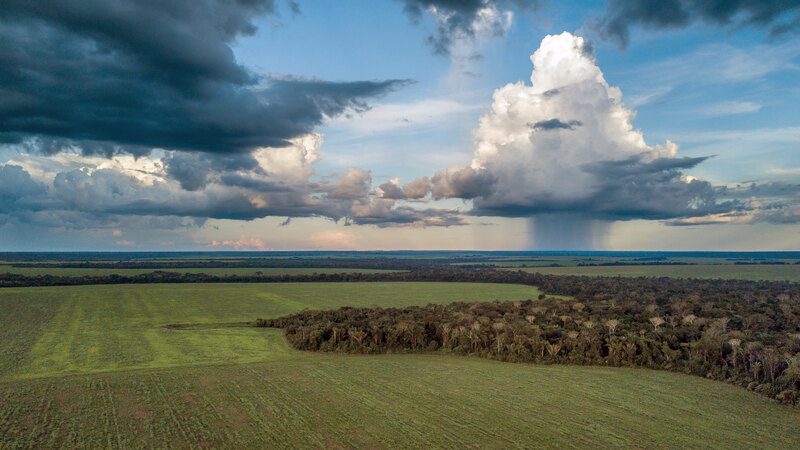 This is the third in a four-part series, The Amazon's Carbon Tipping Point. 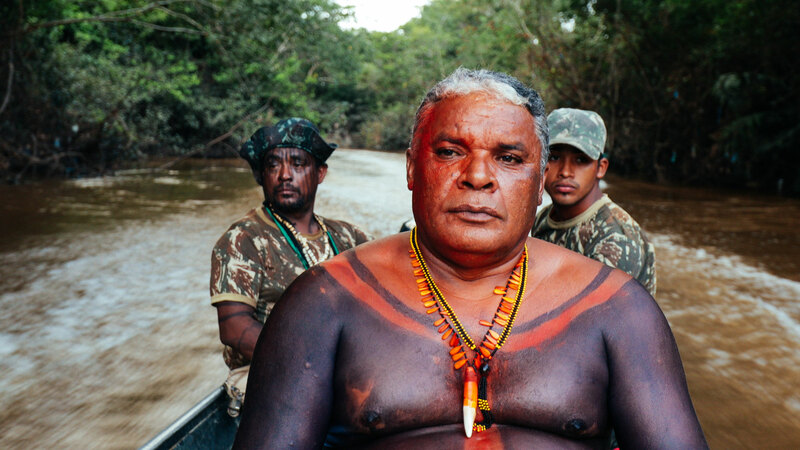 Claudio da Silva and the Guajajara Guardians of the Forest ride up the Caru River to investigate a report of illegal cutting on Guajajara land. “If we go looking in our territory, we always find illegal things going on,” da Silva says before we leave. And sure enough, as we make our way up the river in speedboats, da Silva spots a dugout canoe on the bank on the Guajajara side. We pull up alongside it, jump out and move quickly up a narrow path into the dense forest. There are fresh machete cuts in the brush. And then we hear the sound of men’s voices coming toward us. The guardians crouch down for an ambush, their rifles loaded. A member of the Guardians alerts da Silva about a boat on the side of the river. Da Silva runs toward the sound of voices coming from the forest. The Guajajara find three boys, who confess to cutting virgin timber for charcoal. The Guardians shout commands as three boys appear, with barking dogs at their heels. Soon, the boys are kneeling, with hands behind their heads. They’re from the settlement across the river. The youngest is 14; the other two are in their 20s. They confess to cutting virgin timber to make charcoal, a valuable product in this impoverished region of Brazil. Guardians assemble before heading out to investigate a report of an illegal marijuana farm. Their job is dangerous: more than 140 people have been killed in Brazil defending land since 2015. Da Silva isn’t exaggerating. Brazil has become the deadliest country in the world for land defenders like him, with more than 140 people killed since 2015. And Maranhão, where the Guajajara live, is perhaps the most dangerous part of the country, with more attacks on Indigenous groups here in 2016 than anywhere else. Just after this visit, the body of one of da Silva’s fellow guardians from an Indigenous territory just south of here was found dumped along a riverbank. Da Silva himself says he has received dozens of death threats. But for him, it’s worth the risk. It’s a wealth that extends far beyond the Guajajara’s land and even the rest of the Amazon. Indigenous groups protecting their forests are providing an invaluable service for all of us: helping soften the impact of climate change. Or the fact that deforestation may be driving the entire Amazon, and the services it provides to all of us, to an alarming tipping point. After decades of sucking up huge amounts of CO2 pollution from the atmosphere, the process seems to have stopped and maybe even reversed. If that’s happened, or when it does, that would mean the end of one of the planet’s most powerful buffers against even more dangerous climate change. 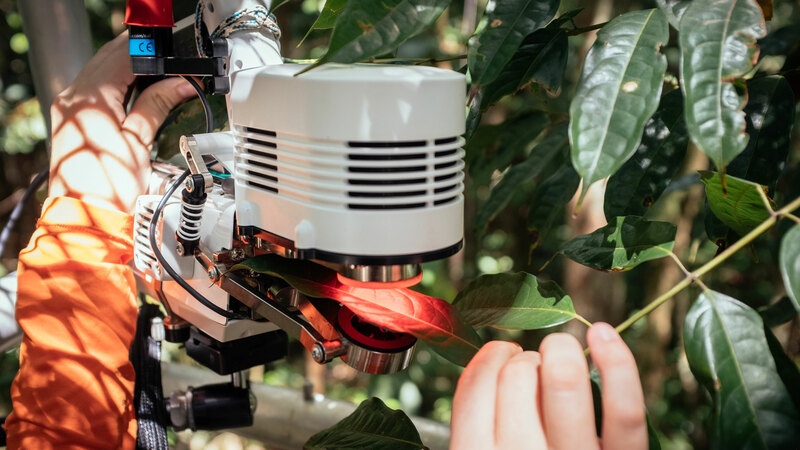 “So, if we lose even part of that, that means that we have to find ways to remove carbon and also, to decrease emissions from fossil fuel much more rapidly,” Nobre says. The Caru River cuts through the land and shows the pristine forest of the Indigenous lands in stark contrast with the deforested area on the opposite bank. Many activists say Indigenous groups like the Guajajara are the last, best hope for saving the Amazon and other tropical forests. And there’s evidence to back that up. 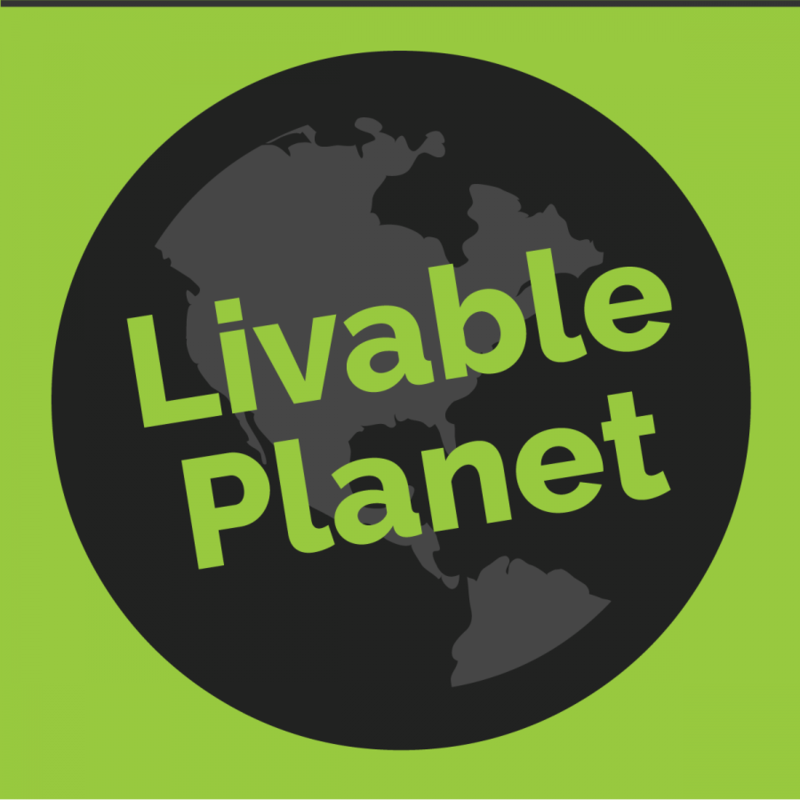 Numerous scientific studies have found that the best way to protect forests is to empower the people who live in them, granting them land rights and legal standing. When Indigenous people live in the forests, deforestation rates remain low, which results in carbon sequestration and cleaner water. But it’s a David-vs-Goliath battle. Protected Indigenous lands cover nearly a quarter of the Amazon. But powerful economic forces are testing tribes like the Guajajara’s resolve — from big ag, mining and logging — to the global demand for meat and soy. And the extractive industries have allies in the Brazilian government. Congressman Nilson Leitão is a leader in the powerful agribusiness lobby, called the ruralistas. Leitão says Brazil shouldn’t be protecting Native lands from modern enterprise. “Brazil’s debt with the Indian is not over land,” he says. Under his leadership, the ruralistas and their ally, President Michel Temer, have stopped the process for creating new Indigenous reserves, defunded the agency charged with protecting the rights of Indigenous people and are pushing to open existing Indigenous territories to agribusiness and mining. “Most Indians live on government grants. Instead, they should be able to exploit their land, and make money,” Leitão says. Brazil’s Indigenous groups generally see this rhetoric as self-serving. And they’re fighting back. Last spring, more than 3,000 Indigenous people descended on the capital, Brasília for a week of rallies and marches. It was the largest Indigenous mobilization in Brazil’s history. 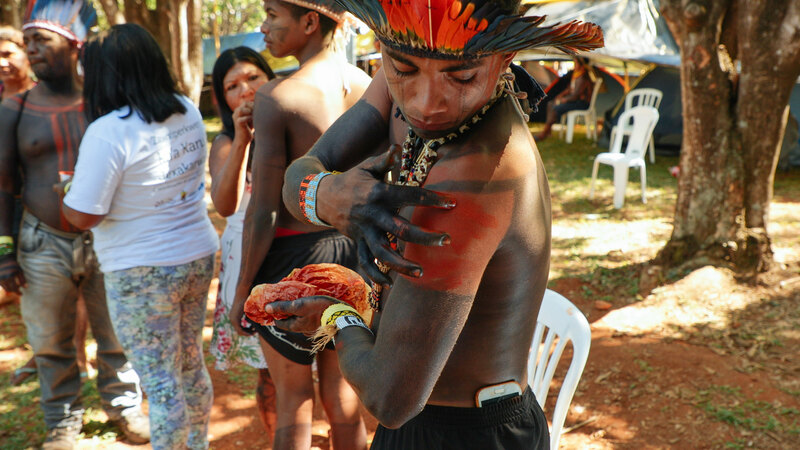 A member of the Guajajara tribe applies body paint in preparation for a protest. 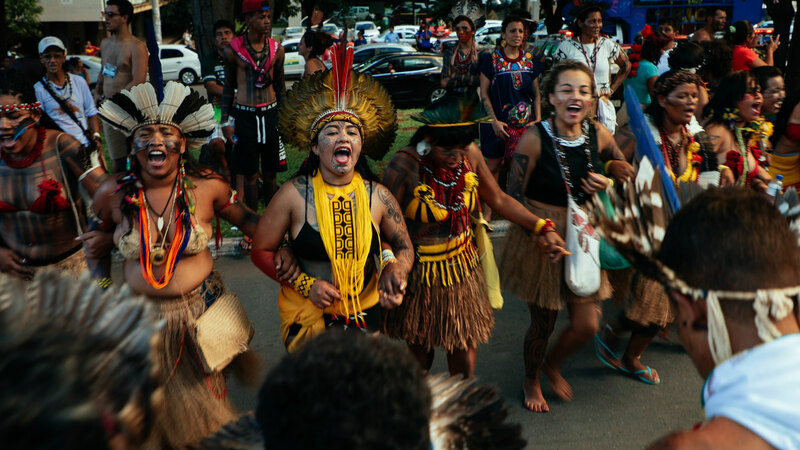 A recent protest in the capital Brasilia was the largest gathering of Indigenous people in Brazil's history. In the Caru Indigenous Territory, da Silva calls the regional office of the military police for backup. The guardians have discovered a possible marijuana plantation on their land. “Confronting drug traffickers is the most dangerous kind of raid,” da Silva says. The next day, eight heavily armed policemen arrive. It’s most likely a rare show of support, da Silva says, because an American journalist is along for the ride. We enter the forest up the river and head up a path with assault rifles and bulletproof vests, checking for trip wires and booby traps. Before long, we find a planted field, but it’s not pot. It’s cassava, planted by land-grabbers after they cleared the trees for charcoal. The guardians cut and burn the cassava. The forest will take decades to recover. "Sometimes, when we see the trees cut down, we feel rage," says Guajajara Guardians of the Forest chief Claudio da Silva. "This is why we keep fighting, so this doesn't happen."